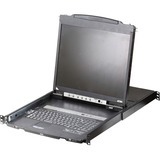 The CL5808 Slideaway Dual Rail LCD KVM Switch is a control unit that allows access to multiple computers from two PS/2 or USB KVM consoles. An extra console port is provided on the rear panel to manage the LCD KVM switch. The CL5808 19" LCD monitor and keyboard/touch pad modules slide independently of each other. To maximize space in your data center, the keyboard/touch pad module slides back to "hide away" when not in use, while the thin profile LCD monitor rotates back, flush against the rack, allowing convenient monitoring of computer activity. Product Description: ATEN CL5808N 8-Port Dual Rail LCD KVM Switch, KVM console, TFT, 19"